Today’s “Meat Free Monday Recipe” comes from my German friend Jasmin, who I met at The Hive blogging conference. Check out her beautiful blog Küchendeern, where she posts German-inspired food and bakes. Hello and Guten Tag to you all great Anne’s Kitchen readers out there. I am Jasmin from Germany, 20-something and totally excited to be here today. Anne asked me if I wanted to do a Guestpost for the Meat-Free Monday. Me! The Carnivore itself! Sure I can I said and here I am and presenting to you a perfect alternative to the daily meat-meals: Green Asparagus on crunchy whole wheat bread, spread with goat cheese and topped with caramelized onion. I am not becoming a vegetarian but with recipes like that I could definately survive a few weeks without a steak. I hope you like it and wish you lots of fun with all the other veggie-posts that are about to come. Wash the asparagus, pat dry and cut off the woody ends. Cut each asparagus lengthwise in half. Peel and finely slice the shallots. 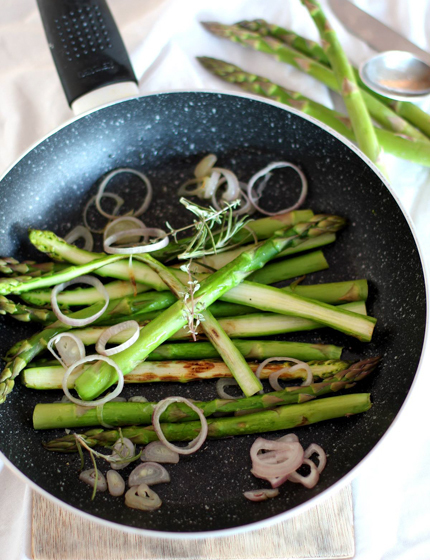 Heat the olive oil in a frying pan and fry the shallots with the asparagus for 5 minutes, until the asparagus are cooked through. Toast the bread until really crispy. Cut open the garlic clove and rub one side of the warm bread slices with the garlic, to infuse the bread. Mix the goat’s cheese and the crème fraiche and season with Italian herbs and salt and pepper. Spread the goat’s cheese generously over the toasted bread and top each slice with shallots and asparagus.